Celebrate Father’s Day by kicking off the weekend with an awesome race taking you on a scenic tour through the beautiful Santa Clarita Valley. Run with friends, family, and kids in a fast Half Marathon, 10K, 5K, or Kids Fun Run. 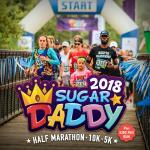 Earn an awesome Sugar Daddy bling and get ice cream at the finish line!